One of our most recent clients Mr Joe Mazon, took delivery of his Epsom Green D110 in Hunterdon County, New Jersey - just in time for Christmas. 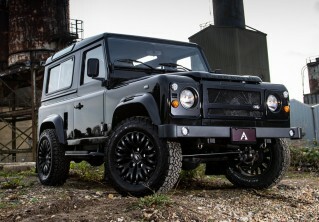 Joe has been dreaming about owning an iconic Defender for years and decided to take the plunge last year, working with Arkonik to build his dream off-road vehicle. Joe tells us about his Arkonik journey below. I was thrilled when I found that I could design every detail, right down to the many color options of the leather interior. After much deliberation, I finally decided on a Defender 110 in metallic Epsom green for the exterior; a deep almost Hunter color with just the right amount of sheen. The interior was fitted with Vintage Thatch leather seats and door panels in a deep chocolate brown and the wood-rimmed steering wheel is an amazing touch. Over time, I eagerly followed the process and awaited the photos to be uploaded to my Arkonik client portal as the vehicle moved through each phase of production. 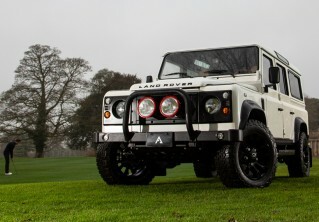 This December, I finally got to drive LIBRA, my custom-built Defender 110 when it was delivered to my doorstep - quite the Christmas present! My family was thrilled with my “present” as well and we spent the holidays driving around in her. Even our dogs loved the Defender, immediately claiming the bench seats in the back as their territory. Check out LIBRA D110 here or contact us for more information.